July 23, 2010 Dan O. Comic book superheroes do roam the world, I’m telling you I saw Spider-Man yesterday in my neighborhood saving a cat from a tree. Bruce Willis plays an ordinary man who makes an extraordinary discovery when a train accident leaves his fellow passengers dead — and him unscathed. Is he truly unbreakable? 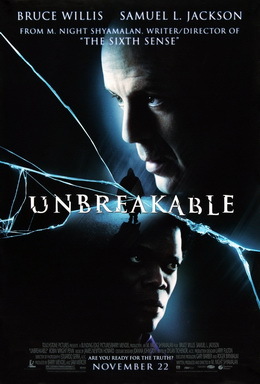 The answer could lie with the mysterious Elijah Price (Samuel L. Jackson), a man who suffers from a disease that renders his bones as fragile as glass. After the huge success of The Sixth Sense, M. Night Shyamalan hd to make something as a follow-up that would get more people into him as a director. I think it worked with this one, still I’m not quite sure. M. Night still uses the creepy atmosphere to convey an emotion the whole film. We don’t quite know what’s going on, until a freak accident occurs then we fully understand it all, kind of. The story moves at a credible pace, and it’s not just about the constant jolts and scares, it’s more about the characters themselves, and how they live with the life they were given. M. Night engages you in the story, and with a couple of twists and turns, the story stays on its feet. I also like how M. Night uses these awkward long shots to show the tension on-screen, and most scenes just have one camera, moving around a room. I felt bad for this film mostly because the whole film is just an excuse for a huge twist ending. And in reality, the twist ending is kind of silly, and very very weak. I don’t know how they could have done a better one, to convey so many shocks, but what I know is that the ending they have was sort of, stupid to say the least. The film brings up the question: What if there really was a real-life superhero in this world? That question wasn’t quite brought up enough times to fully have us imagining a world with one. We only get about 3 instances of somebody being a hero, and it didn’t really strike me as real, or anything reasonable. I thought if they focused more on this question, they could have made the ending a lot better than it actually was. Bruce Willis is once again, the upset husband, but he does play it well. He’s always very good at playing this every-day man character, and adds more substance than just another regular dude, but a guy that is trying to get over the fact that he may have a super power. Samuel L. Jackson is always known for being such a powerful presence in films, but in this one he sort of goes for the creepy role, one that needs restraint, and he does it pretty well. Robin Wright Penn, plays the strong female lead, and has some great scenes where she just lets all of the doubt and anger from her relationship out, and it’s a good performance. Consensus: It may not be as strong, or shocking as The Sixth Sense, but M. Night Shyamalan’s follow-up is still engaging, with real characters, played realistically by the actors, and great story-telling from Shyamalan himself. It’s difficult to discuss Unbreakable without spoiling it for anyone who hasn’t seen it because the twist ending changes your perspective of the movie and, indeed, the genre of the film. But for me this is Shyamalan’s masterpiece. Leaps and bounds better than Sixth Sense which doesn’t work as well when you know the twist, and far better than anything he’s made since. Unbreakable is good, just not as great as The Sixth Sense. When I reviewed The Sixth Sense awhile back, I knew what to expect from the twist ending, however, I still looked at all the other little details, and still found the film to be equally as good with its humane ideas, then its big psychological twist. But, this is still a good one by M. Night. I actually think it’s better than The Sixth Sense because it’s less about the ah-ha ending and more about a layered and well crafted story all the way through. Truly solid work from Willis and I love James Newton Howard’s score here. I think the subtlety and the duality of Willis and Jackson were perfect in the film, plus those Elijah flashbacks were nice touches. Those two had as good of chemistry as Willis Osment in Sense but Unbreakable has higher rewatchability rating than Sense. Enjoyed this too, but I agree that Sixth Sense was the better movie. Looking forward to The Last Airbender too. Sixth Sense was so much better, even despite the ending. And I know it’s going to be terrible, but for some reason I really want to see it. Have to disagree… one of my favorite all time… 9 outta 10 at least! Hey it’s a good one can’t lie about that. I really like Unbreakable. One of my favorite comic book movies and Sam Jackson is great in it. I haven’t seen it in so long, so I’m unsure it will hold up, but for me it’s probably Shyamalan’s best movie. He only has a couple goods ones to choose from though. It’s funny to think that they still let Shyamalan make movies after that garbage Lady in the Water. I have never seen it, but it does quite sound like a crap fest. best movie from shyamalan, willis and jackson despite what the critics say. i thought it was great. if they ever do make a sequel i would go see it. james newton howard did good music for this movie.